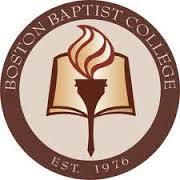 In a quiet residential neighborhood just seven miles from the heart of downtown Boston, Boston Baptist College is a distinctively biblical training center in the context of America's greatest university city. The five acre campus is just minutes away from world renowned educational and cultural facilities, and yet is a quiet and attractive contrast to the rush of city life. The diverse natural beauty of New England's rocky Atlantic coastline, as well as the picturesque mountains just a short drive away, offers an unparalleled location for ministry preparation.